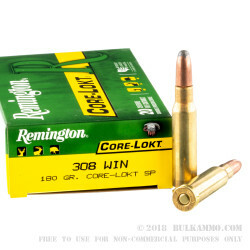 This 308 Win cartridge by Remington features a 180 grain bullet made with the manufacturer’s proprietary Core-Lokt technology. The bullet sports a tapered copper jacket fitted to its solid lead core. That union of jacket and core means the bullet will deliver expansion to double its size upon impact while still retaining its weight, causing deep penetration with a large wound channel that’s guaranteed to take down big game. This bullet further sports a soft point shape, the broad frontal of which conveys great energy upon impact and further promotes expansion within the target. 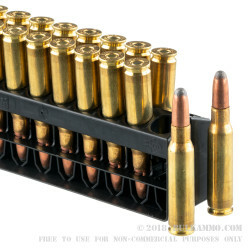 This cartridge additionally offers a non-corrosive Boxer primed factory fresh brass casing. 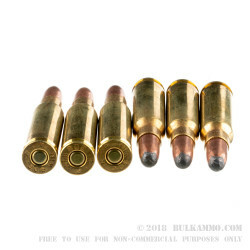 Two hundred of these rounds will have you all set for deer season, and because they are fully reloadable they’ll be of great use in deer seasons to come. 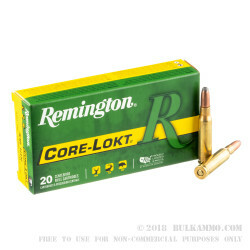 Hunting season is far too rare and precious to bet its outcome on an inferior cartridge -- order these and bank on Remington’s over two centuries of commitment to excellence!